This guide will be packed with helpful information about the shop, the purchases within, the best ways to spend Gems and what deals are the best in Brawl Stars. It will be done in USD, so if you are on the Canadian store or another country, the prices will be different. This guide should be is important for both free-to-play Players and people who spend money on the game. Gems can be bought in Brawl Stars with real money. In fact, that is the only way they can be obtained. Gems serve as a premium currency to buy boosts, special offer, and skins. Like most games with in game purchases, the more you buy at a time, the better the deal. The first thing you should know is that the special packs at level 5, 15, 25, 35 etc. in the game are the best ways to buy Gems. Below is a chart of each offer, with how many gems you get compared to the others. As you can see, the amount of Gems-per-Dollar spent increases as you spend more money at a time. This increase is minimal, so don’t go spending more money just for a better deal. However, if you do feel like you will be spending more soon, try to just wait and spend it all on a bigger offer than multiple small ones. After purchasing Gems, you can spend them on purchasing different items in game. Let’s find out which are the best ways to spend Gems in Idle Heroes! Don’t think about the other buys. The least effective of using Gems should be purchasing one Big Box for 30 Gems. This is the equivalent of 3 Regular Brawl Boxes and that basically means the rate here is 10 Gems per Regular Brawl Box. Next is the Mega Box purchase with the equivalent of 10 Regular Brawl Boxes for 80 Gems. That means it costs 8 Gems per Regular Box. Next is the Mega Box daily deal where you have a Mega Box for 60 Gems. This is 20 Gems discount off the regular price, which is the equivalent of 6 Gems per box. If you are a new player, the most efficient way for you to consistently spend Gems is going to be on the Token Doublers. The Token Doubler in shop will double the next 1000 Tokens you earn from the battles. Which means your net gain will be 1000 Tokens (= 10 Regular Boxes). This means it costs you 50 Gems for 10 boxes, the cost is 10 Gems per box. If you are new to Brawl Stars and you want to give yourself a huge boost right at the beginning, I highly recommend you buy these Token Doublers. Now let’s talk about Event Tickets. This is the second most efficient way to spend your Gems on. On the weekend you can purchase 6x = 10 Gems; 20x = 30 Gems and 60x = 80 Gems. These tickets give you access to the Special Events that only happen on the weekend. There are few different types of weekend events and rewards you earn from those events actually differ between the events. I recommend play them a little bit and determining which events you are able to most consistently earn tokens with and then playing only that one event with the only exception of playing each one at least once every week so you can get the Star Token from that event. 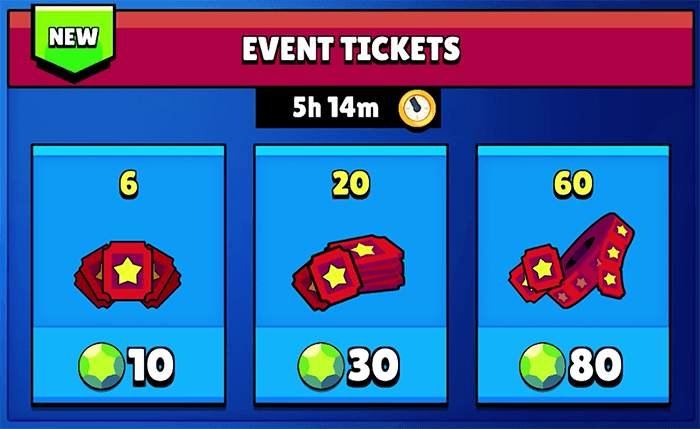 For the 20x Tickets deal, it should be at least 30 Tokens per ticket. and 60x is at least 27 tokens per ticket. and this is the best Ticket deal to purchase. By the way, Special Offers that are 30% off are always the good buys. 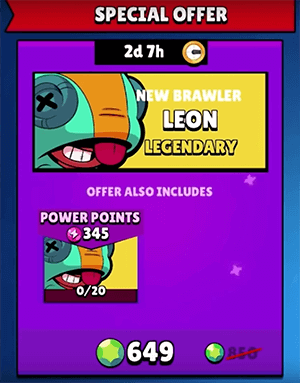 The last one I want to mention is the special offer that allows you to purchase a Super Rare or Legendary brawler for a certain number of Gems. If you have the money and you think the brawler that you want to purchase with those gems is worth it, just go for it. It will help you push faster in total trophies and of course will help support the development of the game. If you don’t have a ton of money, or you are not sure if it is worth it, then it really comes down to how patient you are or how badly you want that Brawler. All it takes you to get one Legendary brawler is one lucky brawl box. It’s just a matter of time before you do actually get that Brawler. The chances are very good that by the time you completely max out your account, you will have unlocked every single brawler in the game including Legendary Brawlers from your regular Brawl Boxes. So If you are not a heavy spender, It’s better to spend those Gems on the Token Doublers or Tickets. That will give you more Gold, Power Points and a lot better skills in the game. And you also have the chance of getting that exact Brawler from the Brawl Boxes. I hope you found this guide helpful. It was my 5th one! I will be taking a break from writing guides for a while, but will get back to writing hopefully when the next update comes out. Hey guys it's KairosTime and this is my official Brawl Stars Up account. Been playing this game since soft launch and I am really getting addicted to it. If you find my guides helpful, don't forget to subscribe to my Youtube Channel for more contents!